Queen Mother Reverend Helen Sinclair -ordained worldwide minister, National Director of Jessie “Ma” Houston Prison Outpost of Rainbow Push Coalition, and one of our Board members – once commented that “In prison, education is often a do it yourself proposition”. Self-education in jail or prison through independent reading offers “a way out” of recidivism and redresses the failure of traditional schooling – one of the root causes of intergenerational incarceration. Winston Churchill said, “It is a good thing for an uneducated man to read a book of quotations”. 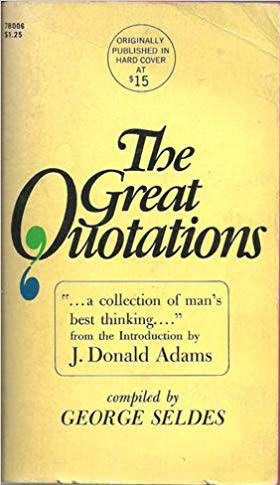 The Great Quotations by George Seldes is one of the most recommended books of quotations. It is known for its scope, depth, and scholarship. This is why it is a selection for our special collection and may be ordered from the Resources section of our website.